Gay U.S. ambassador Daniel Baerhas dropped his congressional campaign. (Washington Blade photo by Michael Key). A gay foreign policy expert who worked on international LGBT rights and served as U.S. ambassador to the Organization for Security & Cooperation in Europe has dropped his short-lived bid for a congressional seat in Colorado. Daniel Baer, who had sought the Democratic nomination to run in Colorado’s 7th congressional district, announced in a statement Thursday he’d suspend his campaign in the aftermath of incumbent Rep. Ed Perlmutter (D-Colo.) deciding to run for re-election. Baer had declared his candidacy in August for the congressional seat after Perlmutter, a six-term member of Congress, announced he’d retire Congress. Initially, Perlmutter had sought to become governor of Colorado, but dropped that campaign. (Rep. Jared Polis, a gay lawmaker, is still in the Colorado gubernatorial race). Weeks later in August, Perlmutter announced he’d, in fact, seek re-election to Congress. Under the Obama administration, Baer served not only as U.S. envoy to OSCE, but deputy assistant secretary of state for the Bureau of Democracy, Human Rights & Labor, where his portfolio included LGBT international human rights issues. 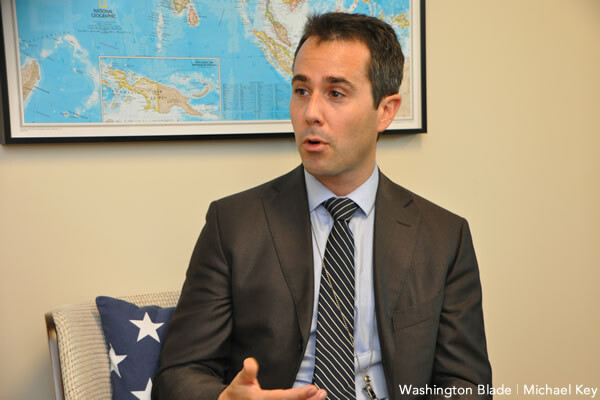 After his appointment as U.S. ambassador, Special Envoy for the Human Rights of LGBTI Persons Randy Berry took over the LGBT portfolio at the State Department. Baer was one of a record number of openly LGBT congressional candidates seeking election ahead of the 2018 midterm election. Other LGBT candidates of note are Maryland State Sen. Rich Madeleno, who seeking to become governor of Maryland; Sen. Tammy Baldwin (D-Wis.), who’s seeking re-election in Wisconsin; and Rep. Kyrsten Sinema (D-Ariz.), who’s running for U.S. Senate in Arizona.